WOOSTER, OHIO–It was a bit of a crowded room in Andrews Library for our geology seniors (and all their friends, family and faculty), but it was a very happy place. 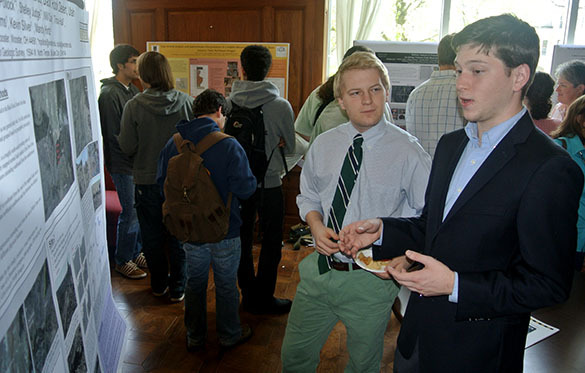 Joe Wilch (above) escaped the crowd, though, because he is a double math and geology major and thus presented his poster in Taylor Hall. His title: “Insights into the tectonic evolution of the northern Snake Range metamorphic core complex from 40Ar/39Ar thermochronologic modeling results, northern Snake Range, Nevada.” Much math ensued in that project. I told Joe to look grim — anyone can smile for the camera. This was the best he could do. 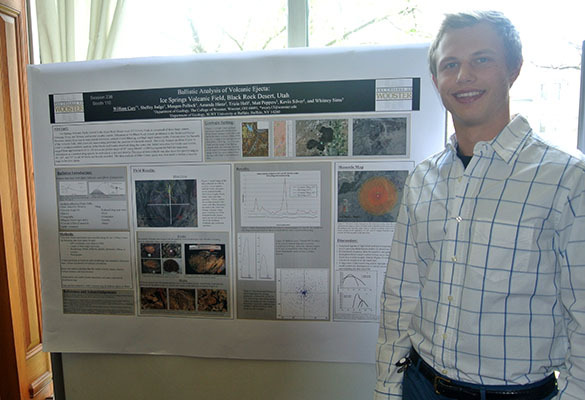 Joe recently gave a poster at the Keck Geology Symposium. He seems to be still wearing the same shirt. Will Cary, a member of Team Utah, presented his poster on “Ballistics analysis of volcanic ejecta: Miter Crater, Ice Springs Volcanic Field, Black Rock Desert, Utah.” He had lots of bright Wooster sunshine behind him. This was fitting because he’s a Wooster boy. 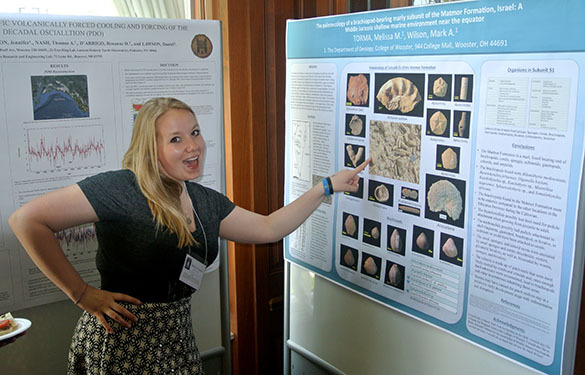 Jenn Horton discussed her project: “Dating the First Millennium AD glacial history of Adams Inlet, Glacier Bay National Park and Preserve, southeast Alaska.” She had many adventures in the Alaskan wilderness this summer leading to this warm and dry session back in Old Woo. 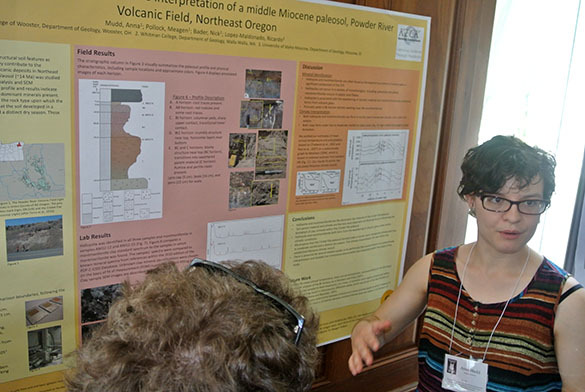 Anna Mudd is here passionately presenting her poster: “Clay mineral analysis and paleoclimate interpretation of a middle Miocene paleosol in the Powder River Volcanic Field, northeast Oregon.” Like Joe Wilch, she also discussed her work at the 2013 Keck Geology Symposium meeting in California. You can see here an image of Anna as a Junior I.S. 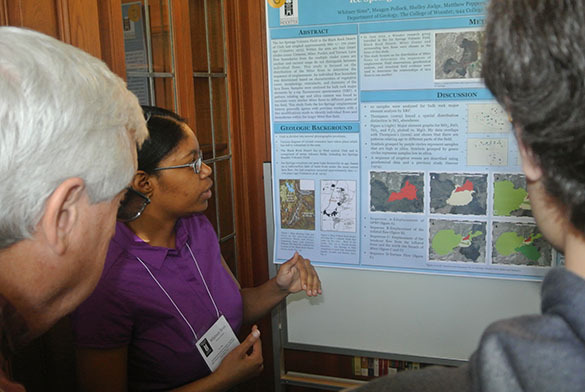 student last year as she began her research journey. Jonah Novek did his fieldwork in the Baltic with the well-remembered Richa Ekka (a member of this class who graduated early). 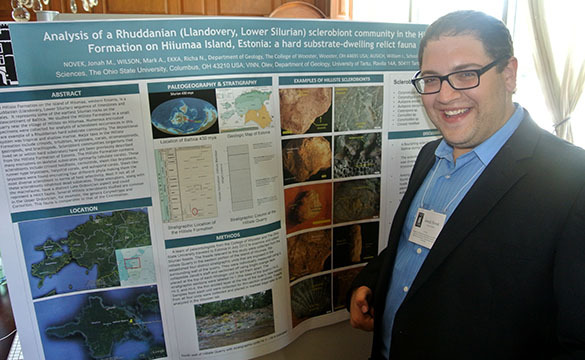 Jonah’s title: “Analysis of a Rhuddanian (Llandovery, Lower Silurian) sclerobiont community in the Hilliste Formation on Hiiumaa Island, Estonia: a hard-substrate-dwelling relict fauna.” I’m pleased that he didn’t wear his tuxedo today. Matt Peppers is another Team Utah member. 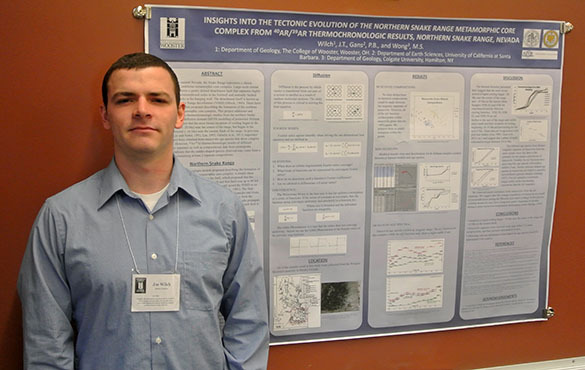 His title: “Analysis of Ice Springs Volcanic field structures, Black Rock Desert, Utah.” Matt is looking dapper in an increasingly warming room. Kit Price did her fieldwork in southern Indiana, and then loads of paleontological lab work back in Wooster. 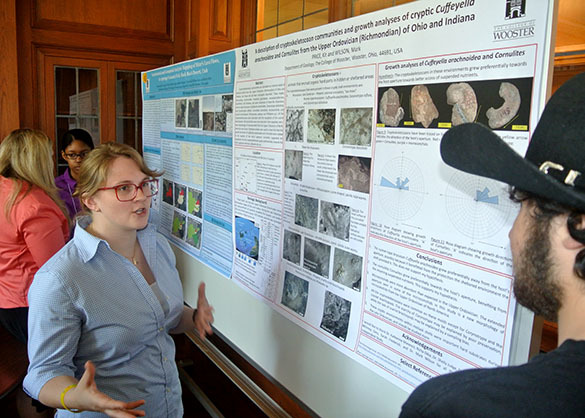 Her project is titled: “A description of cryptoskeletozoan communities and growth analyses of cryptic Cuffeyella arachnoidea and Cornulites from the Upper Ordovician (Richmondian) of Ohio and Indiana.” She appears to be explaining her poster to Johnny Cash. 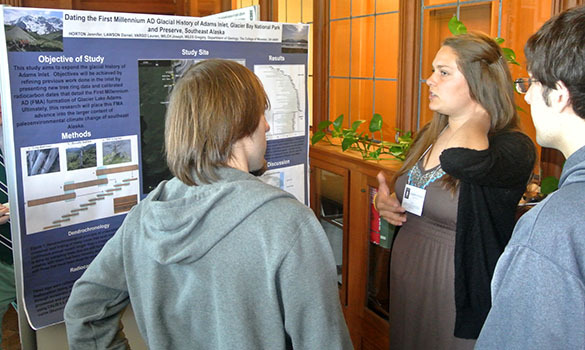 Finally, Lauren Vargo got one more presentation today after her morning talk. 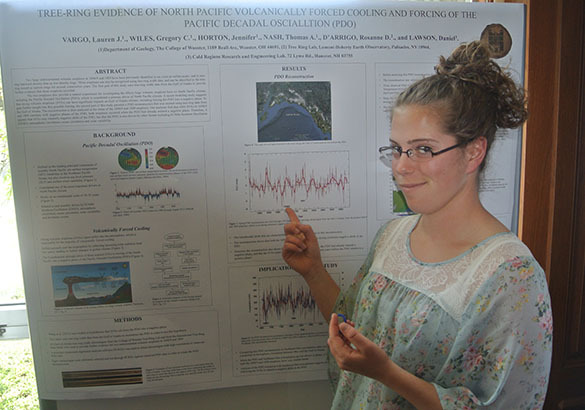 Her title: “Tree-ring evidence of north Pacific volcanically-forced cooling and forcing of the Pacific Decadal Oscillation (PDO).” Gotta love those wiggly lines! We are very proud of our Wooster Geology seniors. Well done, young geologists!